Today was Trunk or Treat at our church. For the uninitiated, this is a version of trick or treat that uses open, decorated car trunks as the “houses” on a “street” out in the parking lot of the church. It’s nice for younger kids – not so much walking, and nothing really scary going on – and since we don’t live in a neighborhood, it’s especially nice for us. We take pictures of Halloween costumes on Gigi’s porch, because it’s not all cluttered with bikes and jars containing wooly bear specimens and especially impressive spiders. As you can see, Batman was feeling his oats. I was happy to discover that the Batman costume did – just – fit over the cast. Levi was pumped (ha!) about the muscles and spent a good ten minutes running around the house posing after we put it on. Elias was less sure about his Diego vest, but utterly won over by the animal rescue pack. 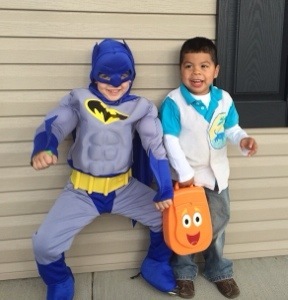 I was very pleased with their costumes, especially considering the budget, which topped out at $9.00 for both boys. The animal rescue pack came from a friend (Thanks, Tricia! 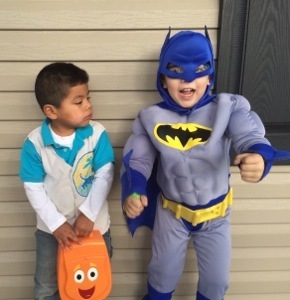 ), Levi’s costume was a $5 garage sale find (Thanks, Janeen! ), and the vest is an old white t-shirt turned inside out and trimmed to vest shape with pinking shears. I found fabric markers at Target for $4 and drew the patch on after a Google search. It’s not exact, but it’s recognizable, which is a lot more than you can say for any previous drawing effort from yours truly. Paul dropped us off at the church and went to calling hours for a former neighbor at the funeral home up the street, and I thought we’d be just fine. Two lemonade spills, a bathroom trip (“Stop touching everything!”), and a nosebleed later, I was reduced to sending texts that started with “Coming soon?” and devolved to “Seriously, help. Now.” I did get all the blood off the gym floor. Let us not speak of the lemonade in the banquet room carpet. At least it wasn’t fruit punch. I did not levy a candy tax this year. I’d like to tell you that’s because I’m selfless and disciplined. But it’s really because I have the good stuff hidden in a cupboard at home. Previous Post We made it. So enjoying chuckles and such as i read the blog. Wow, feels familiar some how!